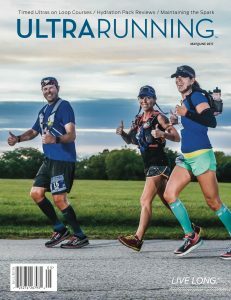 In 10 issues per year, UltraRunning magazine provides extensive coverage of all significant ultras in North America, as well as many major international races. We provide in-depth columns on training and nutrition, race reports, gear reviews and other ultrarunningrelated articles. We print on superior paper and take pride in the quality of photos in our magazine, many of which feature action shots of our advertiser’s brands and products. Advertising percentage is roughly 25%, well below other similar magazines. Our paid readership consists of over 7,200 active subscribers and 2,000 issues distributed through retail store channels, including Barnes & Noble, specialty running stores and health/natural food stores. Seventy-five percent of our readers retain their issues of UltraRunning for over one year, and our total readership is estimated at 24,300 (with 3x pass-through). To get more information about advertising options, including our media kit, please fill out the form below and someone will contact you. Paste results in the box or attach a file in the next field. If you have multiple files, please zip them into a single file before submitting.